In a video shot with a drone, Senegal’s former environment minister denounces rosewood smuggling. Favoured by smugglers and sold to Chinese traders, the precious timber is taken from a region bordering Gambia where native forests have virtually disappeared. Beijing’s neo-imperialism continues in Africa as it gets unfettered assess to raw materials from local leaders without strings attached. Dakar (AsiaNews/Le Monde) – Chinese demand for precious wood from Senegal's last forests could turn them into a desert, said former environment minister Haidar El Ali who slammed the current Senegalese government for inaction against timber smuggling. Imaging from a drone flying 50 metres from the ground along the border between Senegal’s Casamance region and the Gambia shows smuggling of highly valued rosewood*. In Bodjo Sare, one kilometre from the border, aerial footage shows scores of men piling thousands of tree trunks on lorries that eventually drive off to the Gambian capital of Banjul where they are sold to Chinese traders. Rosewood is protected under Senegal’s Forest Code, and exports have been banned since 1998. In Gambia, given the paucity of that country’s own forests, one company has a monopoly on wood exports. The border between the two country is an imaginary line across the savannah, where the last trees are disappearing. The drone footage taken in early March is clear evidence of Senegal’s inaction, and Gambia’s complicity. The smuggling began in 2010. "The government is unable to control the Medina Yoro-Foula region,” says El Ali, “where the Chinese are looting and contaminating the country, while the desert is advancing." The former minister has sent the video to Senegalese President Macky Sall. "Some soldiers are sent to do inspections, but that is not enough,” el Ali adds. “We must create mobile units of determined men to stop the smuggling activity and eliminate corrupt officers." In mid-2015, Senegal had announced that it was recruiting 400 additional agents to deploy against timber smuggling in Casamance. Meanwhile, relations between Gambia and Senegal have soured in recent months after three Senegalese officers were arrested in The Gambia. 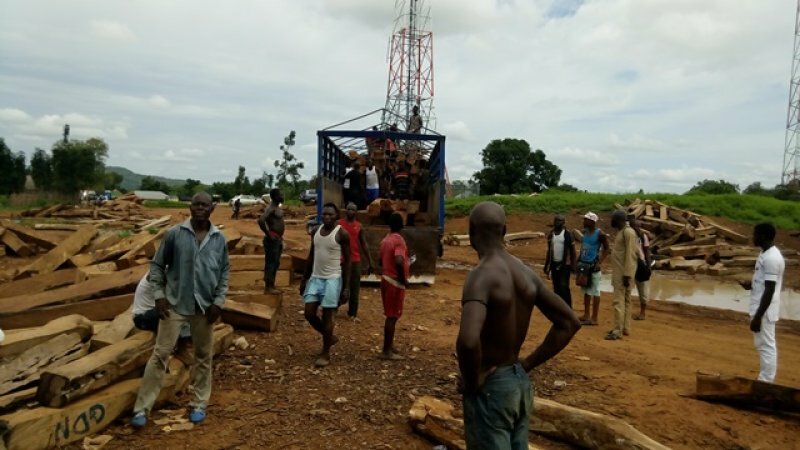 Timber smuggling is not a Senegalese problem alone. The whole of West Africa is involved as the Chinese market proves voracious for its woods. In 2015, Africa provided more than half, three quarters from West Africa, of all the rosewood imported in China. Despite largest-scale deforestation, The Gambia is China’s second-largest supplier after Nigeria. Over the past few years, Beijing has been widening its involvement in Africa through investments and gifts to African leaders without financial, political or social strings attached. In return, Beijing buys raw materials and sells its own gods, undermining local manufacturing. Between 2000 and 2011, China invested more than US$ 73 billion in African natural resources, mines and oil. * Rosewood is also known as African redwood, East African rosewood, brayera, cusso, hagenia, or kousso.